LocalE Review + The Fashion Column Twins Giveaway! "On October 3rd he asked me what day it was. 'It's October 3rd.'" 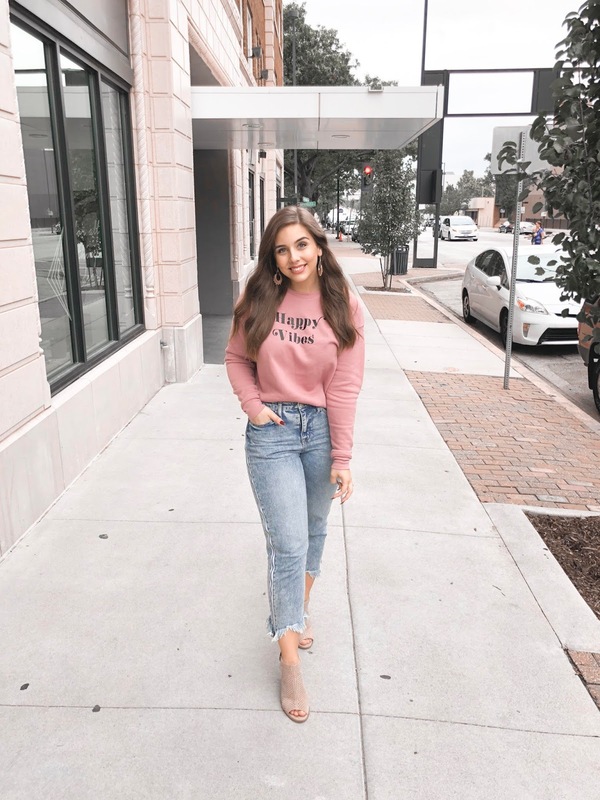 We're going to just consider it serendipitous that LocalE, The Fashion Column Twins, and I happened to plan a (pink) sweatshirt giveaway on Wednesday, October 3rd. What a perfect way to celebrate the magical year when the October 3rd Mean Girls holiday also falls on a Wednesday when everyone feels very compelled to wear pink! Lucky for me Emily and Elizabeth are anything but mean girls. I was so incredibly excited when they reached out to see if I'd be interested in collaborating on a giveaway (check out my latest Instagram post for entry details)! I remember when I first moved to Kansas City their gold sequin sweatshirt was a piece of KC swag I wanted more than anything. I'm so excited to now have it hanging in my closet! Read on for giveaway details and make sure to enter the giveaway here on Instagram! Entries will be accepted through Sunday, October 7! LocalE was founded by Emily and Elizabeth (also known as The Fashion Column Twins) as a way to celebrate style and KC pride. Their shop is filled with the trendy dresses and tops as well as the cutest sportswear, graphic tees, and sweatshirts. I got to pick out two sweatshirts to keep and one to give away! 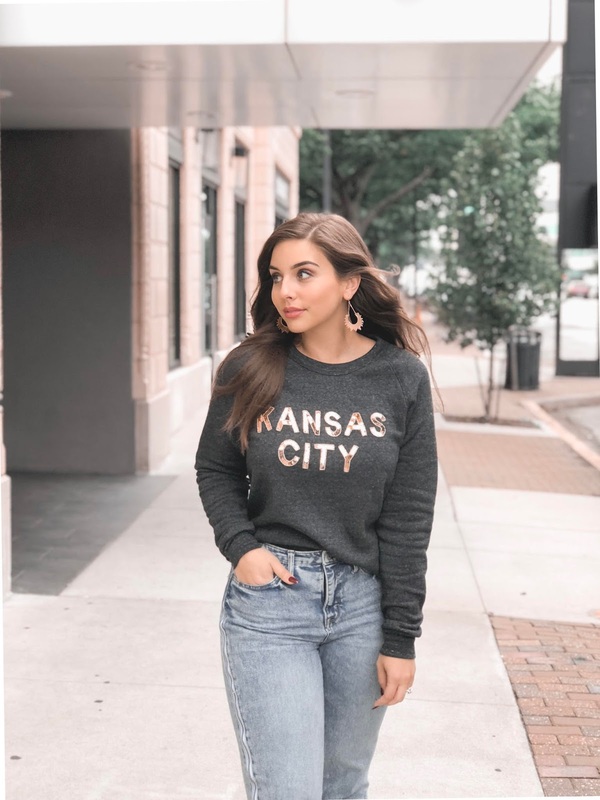 Like I said, I've been a fan of the sequin "Kansas City" sweatshirt for a while! The other sweatshirt that caught my eye was pink and adorned with the words "Happy Vibes." I'm a big fan of the phrase "I think I'll just be happy today" and have been paying a lot more attention lately to consciously choosing my attitude toward life. I know it's silly but having a cute sweatshirt to remind myself of the outlook I want to have each day truly has been helpful! Since I think everyone could use a little more positivity in their lives I had to go with the "Happy Vibes" sweatshirt for the giveaway! You can enter the giveaway here on Instagram through Sunday (10/7). Make sure to follow all the rules to maximize your chance to win! These sweatshirts are so incredibly cozy and ridiculously soft on the inside! The "Kansas City" sweatshirt has a more fitted look and the "Happy Vibes" sweatshirt has a more oversized look. I went with a medium in both and they fit great! 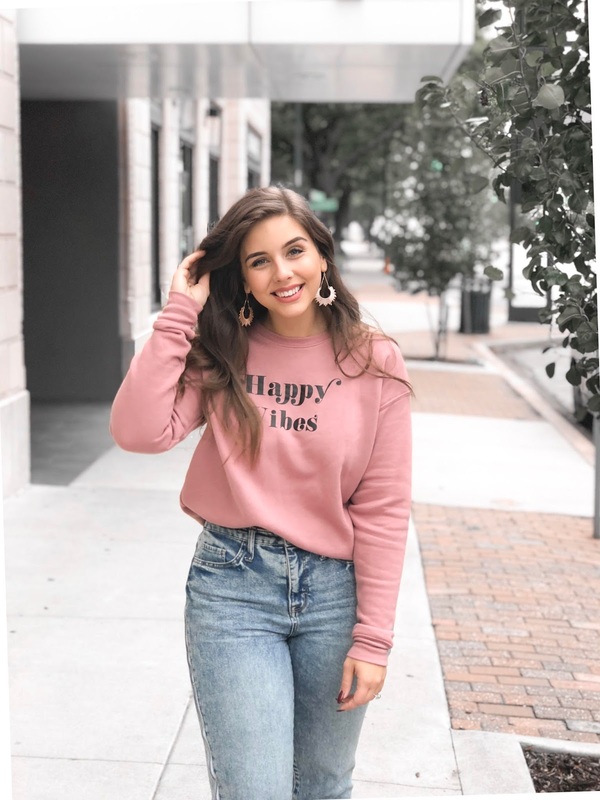 If you are a fan of super oversized sweatshirts, you could size up in the "Happy Vibes" sweatshirt but I found a medium to fit really well! Going into fall, these are to be mainstays in my wardrobe. I can just see the "Kansas City" sweatshirt layered with a plaid collared top and knee-high boots. My go-to look since I received my "Happy Vibes" sweatshirt has been to just wear it with cute leggings. It's just so comfy and makes a simple athletic look way more fun! You can find all of LocalE's products online and can also check out Emily and Elizabeth's Instagram here! 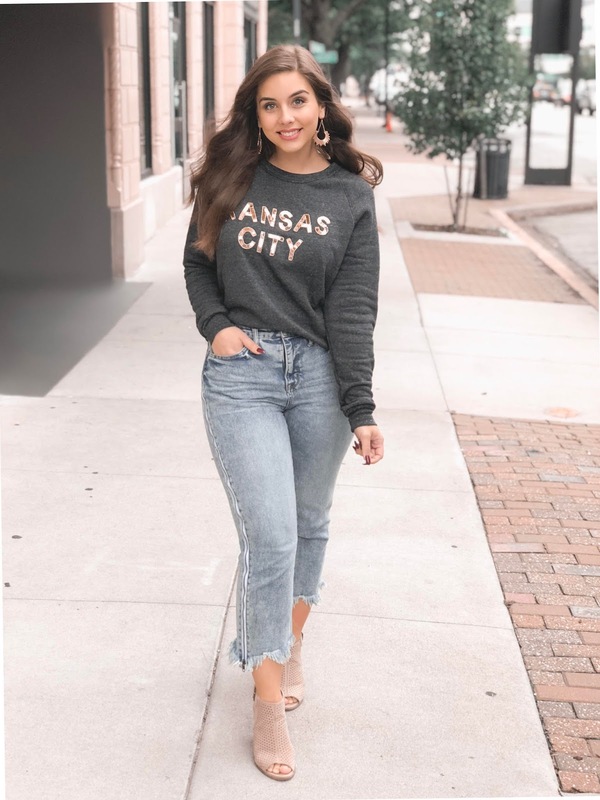 HMK and Made in KC do carry LocalE's red sequin pieces (perfect for Chiefs game days) but all of their other apparel is only available online! Make sure to check them out and let me know what you think - I'd love to see your favorite LocalE pieces! And don't forget to enter our giveaway on Instagram!